COMPETING IDEAS MMS NOVEMBER 2018 30 mmsonline.com Manufacturing Management Everyone Should Be a Waste Hunter WAYNE S. CHANESKI | COLUMNIST Documenting and recording the eight types of waste in any process is essential for any manufacturing operation. Here are a few tips on how to identify each type. Continuous-improvement efforts begin with find- ing then eliminating the waste that exists in a pro- cess. 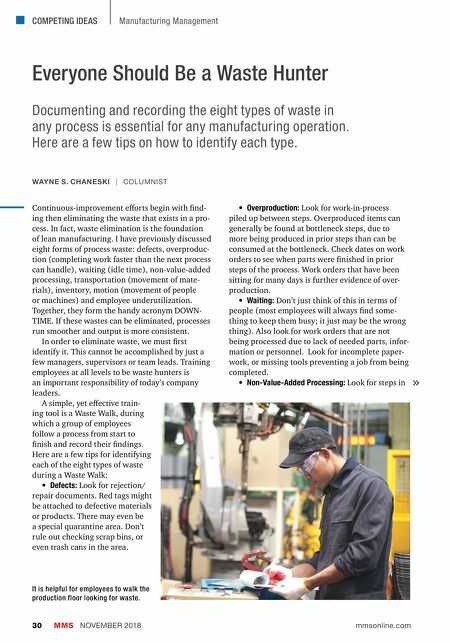 In fact, waste elimination is the foundation of lean manufacturing. I have previously discussed eight forms of process waste: defects, overproduc- tion (completing work faster than the next process can handle), waiting (idle time), non-value-added processing, transportation (movement of mate- rials), inventory, motion (movement of people or machines) and employee underutilization. Together, they form the handy acronym DOWN- TIME. If these wastes can be eliminated, processes run smoother and output is more consistent. In order to eliminate waste, we must first identify it. This cannot be accomplished by just a few managers, supervisors or team leads. Training employees at all levels to be waste hunters is an important responsibility of today's company leaders. A simple, yet effective train- ing tool is a Waste Walk, during which a group of employees follow a process from start to finish and record their findings. Here are a few tips for identifying each of the eight types of waste during a Waste Walk: • Defects: Look for rejection/ repair documents. Red tags might be attached to defective materials or products. There may even be a special quarantine area. Don't rule out checking scrap bins, or even trash cans in the area. • Overproduction: Look for work-in-process piled up between steps. Overproduced items can generally be found at bottleneck steps, due to more being produced in prior steps than can be consumed at the bottleneck. Check dates on work orders to see when parts were finished in prior steps of the process. Work orders that have been sitting for many days is further evidence of over- production. • Waiting: Don't just think of this in terms of people (most employees will always find some- thing to keep them busy; it just may be the wrong thing). Also look for work orders that are not being processed due to lack of needed parts, infor- mation or personnel. 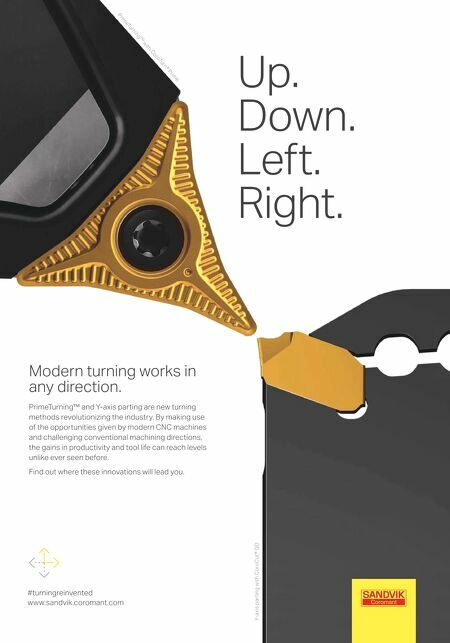 Look for incomplete paper- work, or missing tools preventing a job from being completed. • Non-Value-Added Processing: Look for steps in It is helpful for employees to walk the production floor looking for waste.